EID has frequently highlighted the fact that record U.S. oil and natural gas production has driven energy prices to record lows, saving consumers billions across the country. A new Energy Information Administration (EIA) report released this week puts the importance of low energy prices into proper perspective. 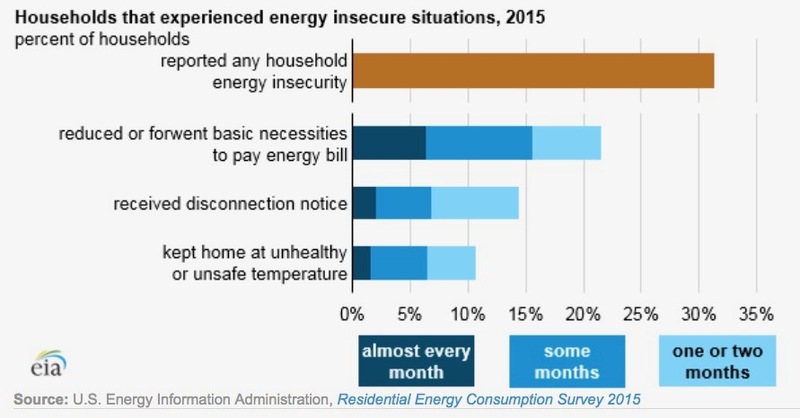 EIA’s most recent Residential Energy Consumption Survey (RECS) finds that nearly one in three U.S. households struggled to pay their energy bills and/or sustain adequate heating and cooling in their homes in 2015. The report reveals that household energy insecurity continues to be an issue in our country. Though different than the energy poverty epidemic that plagues much of the world – where access to modern energy services don’t even exist – household energy security can be just as serious, as households have access to energy, but can’t afford it. Fortunately, the shale revolution has proven to be part of the solution, driving energy prices to record lows over the past decade, while helping alleviate the burdens that, as this EIA report reveals, so many American families struggle with. As EID recently highlighted, the EIA released a report last month that finds average U.S. energy costs fell 34 percent from 2008 to 2016, dropping from record-high levels to a “record-low energy expenditure share” in less than a decade. There is an overwhelming list of evidence that these reductions can be traced to record natural gas production, made possible by fracking. This has not only dramatically reduced residential natural gas prices, but also electricity prices, as natural gas-fired electricity generation has quickly become the top power source in the United States. Earlier this year, Bloomberg New Energy Finance’s (BNEF) 2018 Sustainable Energy in America Factbook reported that consumers devoted less than four percent of their total household spending to energy last year. The report also showed that average national retail electricity prices have declined 5.8 percent on average since their peak in 2008, making up just 1.3 percent of household expenditures in 2017. As the report noted, “electricity is making up a smaller share of household bills than ever before.” Not coincidentally, natural gas-fired power generation has increased 92 percent since 2008. The BNEF report also found that natural gas bills accounted for just 0.4 percent of average annual household expenditures in 2017. 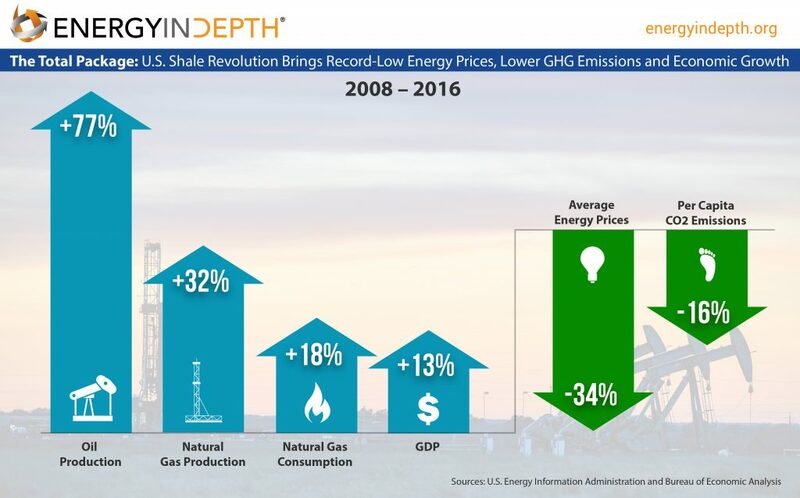 So to quickly recap, average overall energy costs and average electricity costs have fallen from record high levels in 2008 — which happens to be about the time the shale revolution began – to record low levels in the 10 years since. These findings echo numerous reports released since 2015 that assert that Americans are saving thousands thanks to fracking. According to an IHS Economics and the National Association of Manufacturers (NAM) Center for Manufacturing Research report, American families saved, on average, $1,337 in 2015 through lower home energy costs as well as lower costs of goods and services as a result of the abundant supply of North American natural gas. A 2016 EIA analysis shows that since 2008, roughly the start of the energy renaissance, average annual energy costs per household in the United States have dropped by more than 14 percent, while residential natural gas prices declined by over 27 percent between 2008 and 2016. A trio of recent Consumer Energy Alliance (CEA) reports reveal the shale revolution has had even more dramatic positive effects where development is taking place. Thanks to record production in the Appalachian Basin – home of the prolific Marcellus and Utica shales – the region now boasts the lowest natural gas prices in the world, saving Ohio, Pennsylvania and West Virginia residents a combined $80 billion on their natural gas bills from 2006 to 2016. The reports find Ohio residential customers have saved $15 billion on natural gas bills since 2006, while Pennsylvania households have saved $13.3 billion and West Virginians have saved $1.6 billion. Residential natural gas prices have dropped more than 60 percent in Ohio and Pennsylvania, according to the reports. Again, considering household energy security continues to be a problem in America, the importance of the savings the shale revolution has provided really can’t be overstated. For example, according to the CEA’s Ohio report, there are 1.7 million Ohioans — 14.6 percent of the state’s population — living below the poverty line. For those that fall into this demographic, energy expenditures require a quarter of their take-home pay. It is difficult to imagine how these folks would make ends meet if energy prices were still at the record high levels observed in 2008 and their natural gas bills were more than 60 percent higher than they are currently paying. But fortunately, the shale revolution has brought far more affordable energy to the Buckeye State and the nation as a whole – and the best may be yet to come.